If you are planning to sell your house in the near future, you might want to consider doing some upgrades in its looks in order to increase its value. You should to check the entire house for worn-out appliances, malfunctioning lights and switches, old pipes and frayed wires, creaking floors, etc. that will affect the overall value of the property. Adding new fixtures and replacing old ones can considerably increase the resale value of your house, but the surer way to achieve this is to focus on the part where relaxation and vanity lies… the bathroom. Bathrooms can play an important role in augmenting the value of a house, but there are inherent factors that affect whether this is a wise investment: remodeling expenses, the value of similar houses in the neighborhood, renovation quality, market conditions, and house space and condition. Generally, the cost spent on renovation will add to the value of your home, if it does not exceed the neighborhood valuation for a comparable house. Of course, a poor quality bathroom remodeling that is poor in quality or workmanship offers a little chance for an increase. Once you have decided that remodeling your bathroom is a good investment. You should consider your options and goals, are you looking to upgrading an old bathroom to a contemporary bathroom design or remodeling a smaller bathroom to make it seem larger and appealing. Do you need new bathroom fixtures or will a facelift with new bathroom ceramic tile, a new counter or bathroom vanity achieve what you think is needed. You may want to consult with a decorator or real estate staging professional to make sure your bathroom design ideas will address all the issues. But before installing new bathroom fixtures, you should see if the bathroom has enough floor space, you may need to create a new floor plan to accommodate some of the fixtures. There are several bathroom design ideas that you can employ in the remodeling. First, choose the motif of the bathroom and stick to it; if you choose a modern, classic, rustic, or antique style, choose fixtures and accessories that will represent that style and create an overall unified look. Lighting fixtures and accents should match the motif and be expensive-looking, not necessarily meaning they need to be really costly. You can add a separate shower and tub, vanities, a dressing area, multiple sinks, a sauna, a Jacuzzi tub and new flooring depending on your bathroom remodeling budget. Functionality and quality are the utmost considerations and they should guide your ideas on bathroom counter designs and selection of bathroom ceramic tile. Buy pieces from reputable shops to ensure that they are durable, and ensure that every fixture has a purpose, whether for comfort, style or illusion. Also, make sure that the project is finished from top to bottom and nothing is left undone. The project must also follow bathroom and renovation codes. Taking on a complete bathroom remodeling project requires a lot of thinking and time. Magazines and websites are great source for design and decorating tips for your bathroom design ideas, and ask the help of an expert who knows how to deal with the entire project. Once you know what layout works best for you and your home, ensure that your three main work areas being your sink, fridge and oven/cooktop are close enough to each other that they function well when cooking. Old schools of thought used to refer to this as the ‘golden triangle’ with each element positioned on one of the three sides of a triangle. This can be restrictive so the best approach is for all three elements to be no further than 3 metres apart so that they can be easily accessed during cooking. If you are considering a galley style kitchen which has two parallel work surfaces make sure that you have enough circulation space so two people can comfortable pass one another when in the kitchen together. Finally, when planning your layout ensure you have adequate room adjacent to your fridge, as most fridge doors open beyond 90 degrees. It sounds simple but many kitchens have poorly designed fridge recesses where the doors cannot open fully for cleaning and removal of drawers because they are not properly planned. When considering how much to invest in your kitchen, make sure it is of a standard that would be expected of any future purchasers, a cheaper alternative may not be the best long-term investment for your properties re-sale value or your kitchen’s longevity. Materials, finishes and appliances should be the three main considerations of your budget, not as much the Kitchen Manufacturer. Check any large variation in price is not reflective of poor quality materials and workmanship. Similarly check what level of Warranty Insurance they have for both their workmanship and their supplied product, otherwise a short-term gain may give you long-term pain. Finally, if you are investing a substantial amount of money into your kitchen it is worth engaging the services of a good Designer, especially if you are considering structural modifications. Generally there is no such thing as a “free design service,” it will either be built into the cost of your kitchen or frankly not worth paying for. Kitchen Manufacturers that offer Qualified Kitchen Designer services will restrict you to use their services to pay their designers wages. Engaging the services of an independent Kitchen Designer or Interior Designer to draw up your plans for you will give you more flexibility and allow you to ethically shop around. An Interior Designer will be more qualified to assist you with space planning and can give you a more holistic approach to your design process. A deck builder improves the entire dynamic of a property, especially during those months of the year when regular outdoor activity is possible. For those property owners who contact a reliable contractor now, they may be able to have their deck project completed in time for the height of deck season – summer. Many recent deck owners report that their new structure has had a bridging effect between their indoor and outdoor life. For homeowners who wish to utilize their entire property and not remain cooped inside, this feature is ideal. During the winter residents tend to live a very indoor existence as temperatures steadily drop. The time to enjoy the outdoors is now, during the beautiful summer. A good contractor can create this outdoor living platform to your specifications. Perhaps a square or rectangular deck is what will work best for your property’s specs, but you should not feel confined to only traditional blueprints. Try a contractor who excels in various shapes and adding options, such as an outdoor fireplace, which can extend your outdoor dining experiences at home through the autumn. You may be interested in a custom deck with multiple features. It is nice to know that you have options from craftsmen with the ability to provide them. If you have a pool or a hot tub, you may want to consider maximizing your bathing experience with a custom-built deck tailored around these areas. These platforms may surround the pool, or you may consider a drop-down hot tub space for easier access. Sometimes what is needed is not a new deck. 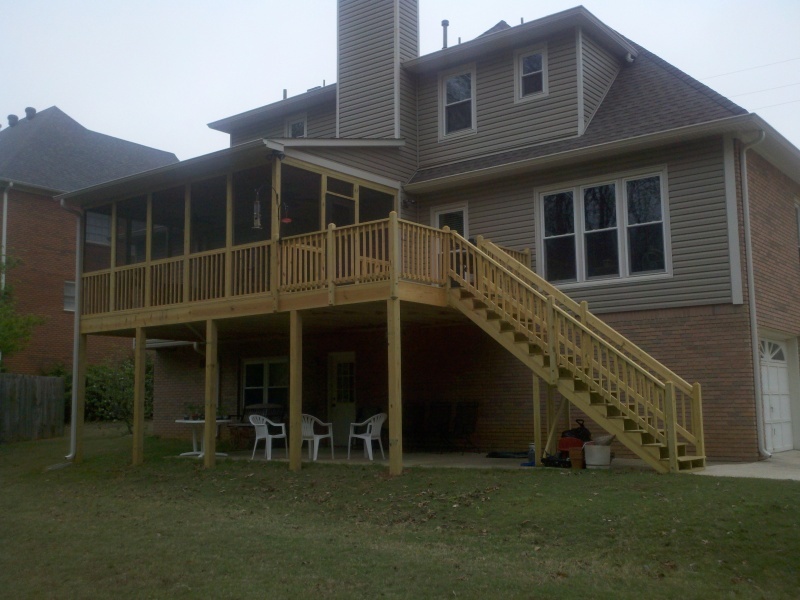 Sometimes your existing deck simply needs a facelift. This can be done by proficient craftsmen by retaining the frame and other support structures and replacing the decking and railing. It’s an elegant option for older homes. The grilling season is now in full swing. There is nothing quite like having all of your loved ones enjoying life in your backyard playing catch, enjoying beverages and possibly taking a dip in the pool. A deck is the perfect place to set the grilling station, as well as the ideal setting to enjoy a nice meal cooked outside. Grill your burgers, hotdogs, chicken, fish and veggies, and don’t forget your desserts (yes, they can be grilled, too) on a new deck. Summer is the season for life, and a deck builder can help increase quality of life now.